Valentine’s Day is often a day of anticipation. However, with the increase of cyber scams online, Valentine’s Day is also a good day to ‘cash in’. 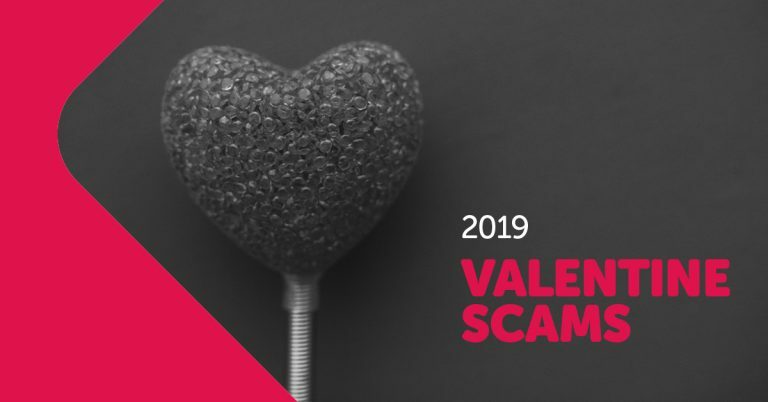 To put this into perspective, in one US state, it is estimated that US$300,000 has been lost in ‘Sweetheart’ cyber scams in the first 5 weeks of 2019 already. So, before you press that button, or click that link, here are 3 cyber scams to be aware of and some quick pointers on what to look out for. Surprisingly, this is still one of the most commonly used methods to unleash malware on your system. According to Consumer Report, scammers rely on the curiosity of their victim to see what is on the other side of that link. Generally, the email will have a message which is from your ‘Secret Admirer’. This will entice you to click on the link. WHAT TO DO: It should be a rule that you do not click on any link from anyone you don’t know personally. While curiosity may get the better of you, the best thing you can do is to delete the email. After all, a person who is familiar with the Australian Digital Landscape would not send you an E-Card with a message from a ‘Secret Admirer’. Australians lost over $30 million in mobile scams in 2018. Valentine’s Day is just another opportunity for scammers to access your funds. Just like the E-Card Scam, a text will be sent to your phone with a Valentine Message. Notably, you will be asked to click on a link. WHAT TO DO: Once again, you should make a rule that you do not click on any link. Read the article 4 Steps You Can Take to Protect your Phone from Hackers, which states that a phone is currently the primary target to obtain funds. If you think it is from someone you know, give them a call to find out if they sent it to you. However, it is best to delete the message. There has been a rise of fake online florist this year. This does not only impact consumers, but florists as well. One florist spent over $22,000 with an online flower supplier, only to have no flowers delivered to their store for Valentine’s Day. Such is the increasing frequency of these scams, that the Better Business Bureaus in the US have urged people to confirm they are dealing with a real florist before completing an online purchase. Fake Deliveries is another method that has also been used. This is generally teamed with a person calling from a fake company stating that they have a delivery. Once address details have been obtained, a person will deliver a bouquet asking for a small payment towards delivery. This is completed with you handing over your credit card details. Tanya Moodley, the CEO of Perth-based chocolate bouquet company, Tasty Gifts, said that they have adopted a cyber security approach to their deliveries this year. Together with a 4-step process, customers are informed of who will be making a delivery and when. If you believe that you have fallen victim to a cybercrime, the first thing you need to do is secure your bank accounts by contacting your bank or financial institution. Whilst this may be an incredible inconvenience, particularly given that your cards are likely to be cancelled and replaced, but given that it is likely that the scammer is overseas, your right to recovery may be limited. Note, that it would be preferred if you contact your bank in person or over the phone (given that your computer may be compromised). The other added benefit is that sometimes, the banks can recover lost funds by reversing or stopping fraudulent transactions. For that to be effective though, speed is key. The next thing to do is to report the incident. The Australian Cybercrime Online Reporting Network (ACORN) is a national initiative that has seen all major police forces around Australia unite to form a centralised reporting system as part of the National Plan to Combat Cybercrime. In doing so, it is suggested that you preserve as much evidence as you can, but not at the sacrifice of keeping yourself exposed. There are also a number of consumer agencies that offer reporting mechanisms and support. At a Federal Level, the Australian Competition and Consumer Commission offers a reporting feature, support and a very useful scam database to keep you notified of the types of scams that are currently prevalent. In Western Australia, the Department of Mines, Industry Regulation and Safety maintains WA ‘Scamnet’. Scamnet, much like its Federal counterpart offers reporting, support and a useful database of known scams. From there, it becomes about recovery, and how successful you are will depend on the nature of the scam and the location of the victim. Make no mistake, the perpetrators of these scams are committing a criminal offence. The issue facing law enforcement however is finding the wrongdoers and subjecting them to the full weight of the law. For example, if the scammer is located overseas, quite apart from the obvious difficulties in locating the wrongdoer, there may be jurisdictional issues and the issue of co-operation with overseas authorities. Even then, if the wrongdoer is found and prosecuted, the chances of recovery from the scammer can be limited, even if the court orders a restitution order. From there your alternatives are predominantly your bank who can recover your lost funds or pay compensation depending on the circumstances of the transaction. We suggest speaking with your financial institution to ascertain their fraud policies. Ultimately though, the best form of prevention is you. Valentine’s Day is a day to enjoy with someone special with the investment of the best intentions. Adopting smart cyber habits will help towards keeping this day as a day of chocolates, flowers, dinners and romance. Brenda van Rensburg has an extensive background in computers and technology. Over the past 4 years, she has worked with local councils to deliver cyber security seminars within Perth’s communities. In 2017, she was a finalist for the WA Telstra Business Awards. Recently, Brenda was accepted into Murdoch Law School to continue her journey towards becoming a Cyber Lawyer. She is concurrently formalising her cyber security certification through South Metropolitan TAFE, and international agencies. Kott Gunning thanks Brenda for the opportunity to collaborate on this article. Tim Kennedy has extensive experience with cyber fraud related matters. This has included obtaining compensation for all three victims of the infamous property fraud cases which saw properties in Western Australia and the ACT sold by scammers who had assumed the identity of the owners. Read Astell v Australian Capital Territory. Tim has also advised service providers and consumers in relation to “man-in-the-middle” scams which sees hackers alter the bank details of invoices so customers pay the hacker instead of the providers.